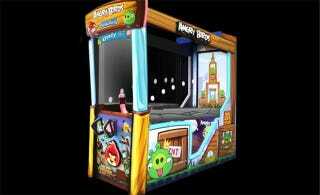 You might have seen some Angry Birds arcade machines before, but they’ve just been big-screen ports of the mobile game. There’s an official Angry Birds arcade game coming, and it looks a lot more fun than the Angry Birds you’ve played and are now ignoring steadfastly. As Arcade Heroes reports, this isn’t your standard arcade cabinet. Instead, it’s an 8′ long behemoth, with a 55” screen at the rear. All that space is there because to play this version of Angry Birds you actually pull on a replica slingshot, meaning it’s basically a new experience, throwing all your old side-on skills in the bin and asking instead that you get real used to an actual sense of depth. They launched today at Dave & Busters, who have it on exclusive until Labor Day (after which you’ll be able to play it...somewhere else that has the room).